Much like the Niagara 7000, the Niagara 1000 uses ultra-low resistance solid-core wiring optimized for low-noise directionality, capacitor forming technologies that vastly improve linearity and minimize distortion, and low impedance AC inlet and outlet contacts with heavy silver plating over high-purity Beryllium Copper for superior noise dissipation. Similarly, Niagara 1000 features Audioquest’s non-sacrificial surge protection, Zero Ground-Contamination Technology, and over-voltage shutdown, ensuring that your A/V systems are thoroughly protected from AC surges and spikes. While the Niagara 1000 lacks the 7000’s sophisticated Transient Power Correction and Dielectric-Biased AC Isolation Transformers, it does employ Audioquest’s patented Ground-Noise Dissipation System and Ultra-Linear Noise-Dissipation Technology. 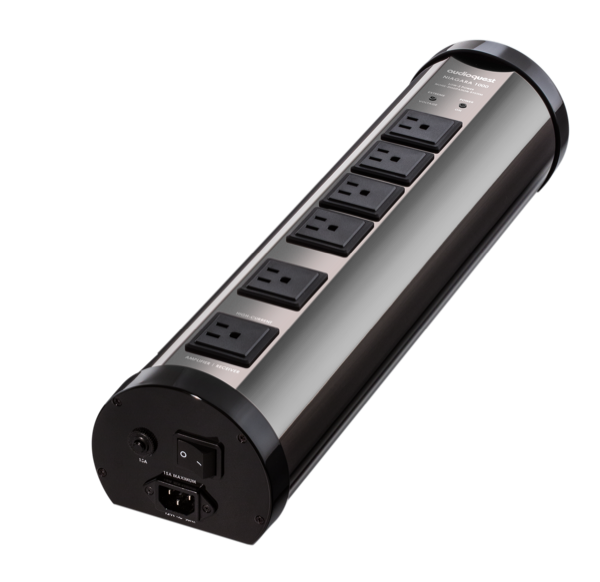 And, whereas the Niagara 7000 has 12 AC outlets, the Niagara 1000 fits six high-performance outlets into its sleek chassis. In addition, input current maximum capacity—20 amps RMS in the Niagara 7000—is 15 amps RMS in the 1000.